The bicycle produced the world’s first major industry selling directly to the public. To understand it better, compare it to the modern car industry. And also consider the cycle industry’s 19th century manufacturing roots: a combination of the sewing machine industry which immediately preceded it, and – in terms of factories and wholesale distribution – the American meat-packing industry. With a subsequent cash-flow never experienced before, bicycle manufacturers created an all-encompassing infrastructure, including production lines that predated Henry Ford, political lobbies to upgrade roads, and countrywide networks of sales agents and servicing facilities. This meant that when the automobile arrived it was able to become the dominant mode of transportation in a very short space of time. Motorcycles had a separate market. In the 1880s a deep social division arose between tricycle and bicycle riders. Tricycles were expensive and endorsed by Queen Victoria, who bought several (though did not ride them). They became popular with society ladies who rode them around Hyde Park and then stopped for tea. Meanwhile, second-hand velocipedes and ordinaries became cheap enough to be ridden by working-class chaps. They raced them and were fuelled by beer. You could say that tricycle users evolved into car owners; while among bicycle owners there were many ‘scorchers’ who thirsted for speed, and adopted the new ‘motor bicycle’ as their preferred mode of transport. 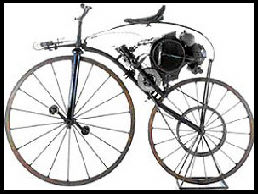 The first ‘motor bicycles’ were essentially just that …bicycles with engines grafted onto them. The next few pages illustrate some of these early machines, from the earliest examples to the fashionable ‘cycle-attachment’ engines of the twenties. The first idea for a cyclemotor, ie a cycle with a motor attached, appeared in this cartoon in France in 1818, showing a contemporary hobby-horse cycle with a steam engine attached. The concept of a motorized 2-wheeler was covered by other cartoonists, but it was not until the cycle industry was properly established in the 1860’s (Michaux in France) that the idea was put into practice. This Michaux-Perreaux Steam Velocipede of 1868 is a Michaux boneshaker cycle powered by a Perreaux steam engine. With its drivebelts and pulleys and separate pedals, the concept is remarkably similar to the postwar cyclemotors with which we are more familiar. This machine is the prototype of both cyclemotors and motorcycles as we know them today. In the first decade of the 20th century, the design of what we now call ‘motorcycles’ and ‘cyclemotors’ diverged. The first engine-attachment units were produced for fitting to safety bicycles without any structural adaptation being necessary. 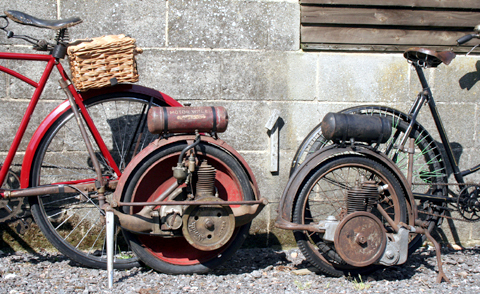 The four-stroke 143cc Clement and the 211cc Minerva (pictured left) drove the rear wheels via a twisted leather belt. Over the next decade, cycle frames were strengthened to take the extra weight and speed, components such as front forks were upgraded. 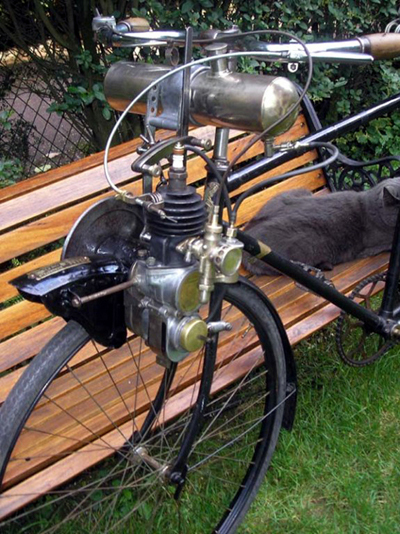 As motorcycle development improved, the first primitive type of cyclemotor was superseded. By 1910, motorcycles were well-established, and their engine sizes increased. But there was still a market for lightweight machines – a halfway stage between bicycles and motorcycles. 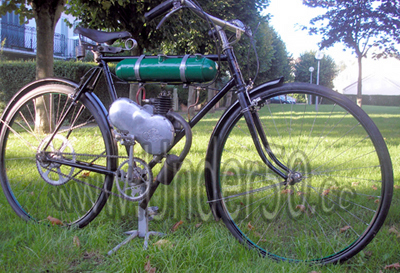 As a result cyclemotors were soon developed to be marketed as auxiliary engines for bicycles. ‘Although primarily, at least in name, a pedal bicycle show, the chief interest of the Stanley lies in the motor-cycles, except perhaps for the Wall Auto-wheel, which forms a missing link between the two classes. This ingenious contrivance consists of a small pneumatic-tyred wheel carrying a 1 3/4hp two-stroke horizontal engine, by which it is rotated through reducing gear. Thousands of Wall Auto-wheels were sold before the end of 1914, at a cost of £16 16s (16 guineas) each. Although other reliable auxiliary models were also marketed successfully, the Auto-wheel was really the first popular cyclemotor, and so could be considered responsible for the subsequent popularity of this type of vehicle. 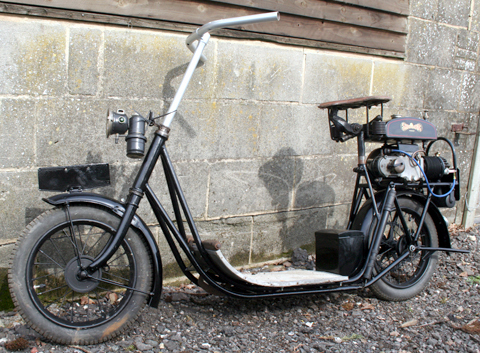 By 1915, it was made under licence in the USA as the Smith Motorwheeel (and, later, by Briggs & Stratton), and even fitted to invalid chairs for wounded soldiers. You can compare the Smith (on the left) and the Wall (right) in the picture above of the two machines I owned until recently. 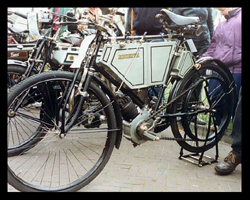 Other popular British models of the day were the 1913 J.E.S Auxilliary Motor Set, pictured above, and the Cykelaid, below. They aptly illustrate the other two positions favoured four mounting an auxiliary bicycle engine. By the 1920’s the price of a small car in Britain had come down to just £100 and petrol was around 1/- per gallon. In this heyday of motorcycle production, Great Britain had more vehicle manufacturers than any other country. Small engineering companies all over the country provided lightweights with proprietary engines, and there was less demand for cycle attachments for bicycles. Female riders were now less attracted to bicycles with engine attachments, because this was the first boom era for motor scooters. There was even a model, the Silva (above), made by T. and T. Motors Ltd of London, in 1919, that featured a Wall Auto-wheel engine in the front wheel. Similar (stand-up) scooters had been around since 1916, but by the early twenties manufacturers were fitting seats to their scooters and models such as the Skootamota were proving popular. 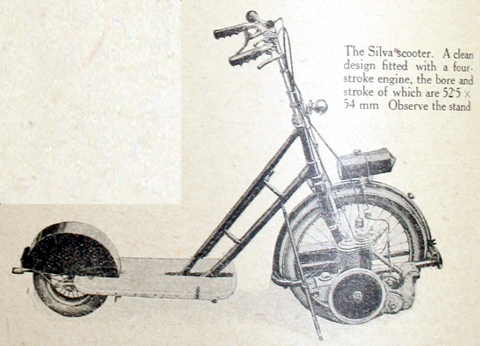 Compare the advantages offered by the 1921 Skootamota (below) with the stand-up scooter above and motorized bicycles. Significantly, it follows the open style of a loopframe bicycle so female riders would have found it more comfortable to ride without needing special cycling or motorcycling clothes. 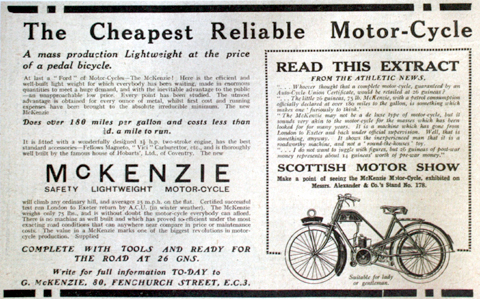 McKenzie did try to fill the gap in the British market (see the advert above), though was not particularly successful. Continental Europe had a large rural population at this time, increasingly in need of transportation. German and French manufacturers decided to chance their luck with cycle attachments. 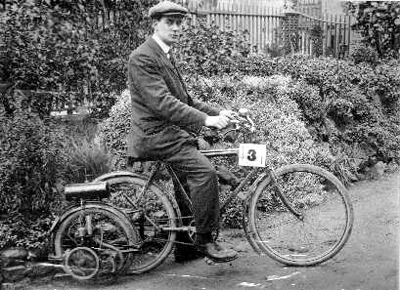 So the ‘second era’ of the cyclemotor was mainly a European one. 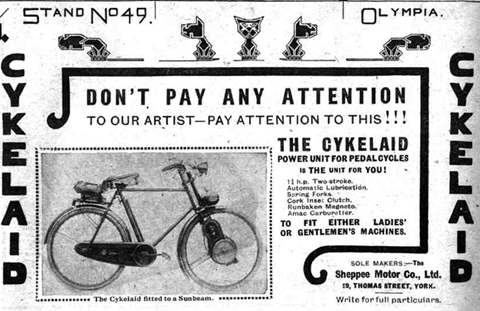 The example pictured in the advert above is the Cyclotracteur; and below the 1923 la Cyclette. La Cyclette is a typical auxiliary engine of the era, and with its mid-mounted belt-driven engine it is very much in the style of the early machines of the turn of the century. Compare the advert above with my old La Cyclette, pictured below. This attachment would originally have been sold separately, to be attached to whatever bicycle you wished; this one is fitted to a contemporary Peugeot bicycle. These French cycle attachments were expensive in their day, and also they were not very efficiently designed. In particular, the heavy front-mounted attachments such as the Cyclotracteur and the Labinal Micromoteur made the bicycles very unsteady. In fact, the early 1920’s cyclemotor boom was short-lived, and the machines themselves were mostly bought by Paris socialites who enjoyed riding them around at weekends to show off. The 1923 Rosengart advert below sums it up quite well. Here’s a closer look at a Labinal Micromoteur. This one has an early engine number, so it’s most likely 1922 or 1923. 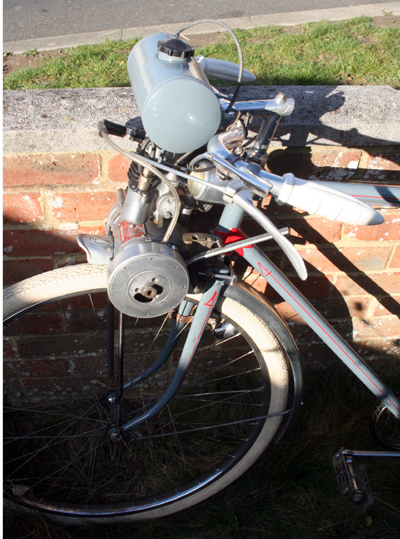 To bring us into the ‘third era’ of cyclemotor, compare a front-mounted 1920’s ‘moteur auxiliaire’ such as the Micromoteur, above, with the 1949 le Poulain Model A, below. www.Cyclemaster.co.uk, the Online Cyclemaster Museum, covers postwar cyclemotors, from their introduction and through various incarnations into mopeds. It’s interesting to consider just how many different models were available from all the European cyclemotor/moped manufacturers from 1945 until, first the ‘moped’ in 1955, and then the Japanese motorcycle invasion of the early sixties, effectively killed their market. But for a short time, the market was absolutely flooded with cyclemotors. So much so, however much you know about the various marques and models of this period …you’ll still be surprised when yet another crops up you’d not previously heard of. 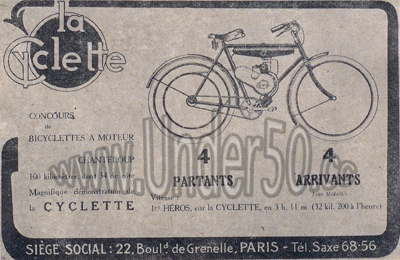 The French Velosolex was undoubtedly the World’s cyclemotor market leader. And it still is …as a brand new model has been introduced! The modernized version of the S3800, known as the S4800 or the Black ‘n Roll, is assembled in Courrieres, France, with components and parts coming from France, the EU and Asia. 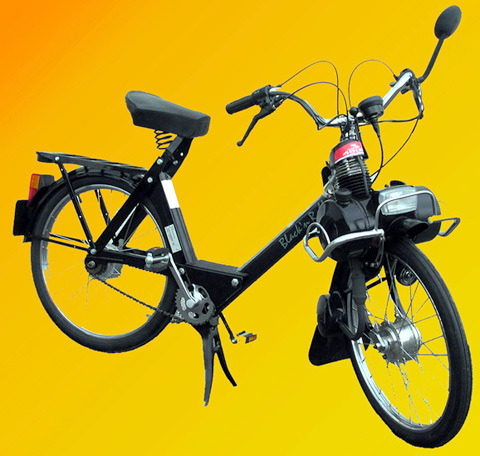 And, now, Chinese bicycle auxiliary engines are being sold in the UK, though registering one in the UK can be a nightmare, and some are misleadingly sold as under 50cc to be used with a car license but are actually of a higher capacity. With ecological considerations now in favour, bicycle-based transport is currently enjoying a resurgence; probably the most practical ‘cyclemotor’ on the market today would be a bicycle with an electric motor already fitted, as no license, registration or helmet would be required to use it. The Cyclemotor is definitely not dead. Long live the cyclemotor!